Pre-mom years, I loved visiting art museums with my husband. But once I had Chuck... I put aside those visits because of my fears. But oh, how I love looking at beautiful things.... and oh, how I love making art and crafts with my son. Now that he's a bit older I figured it was time to give it a try. So I asked for suggestions on FB... and we bravely visited the art museum with our 3 very active and curious kids. It went pretty well! We had fun and the art stayed unharmed! Huzzah! So here's a post detailing 7 things that we did to make our art museum experience more enjoyable (and educational) for the kiddos. 7 ways to make the art museum fun for you and the kids! Now, I'm not saying that you need to look up all the artists exhibited and learn their lengthy histories as well as a bunch of fancy art terms so you can teach it all to your kids. (Although if you can do this-- kudos to you. I'm lucky if I find enough time in the day for private showers!) Nope. I'm talking about minimal research here. Find the museum's website, peek around the exhibits just so you have a vague notion about what might be interesting. Or get the Cliffs notes version and ask for the advice of friends who've visited the museum before. Or, if you don't have a chance to do any of that... no worries! Just talk to the person at the front desk. They'll probably know the locations of the kid-friendly exhibits. The tiniest bit of research will surely help guide you the day of your visit. I know, I know. Duh Leslie. This is an obvious tip.... but oh, it's so important! We all know that hungry preschoolers and parents are cranky preschoolers... and parents. Most museums probably won't allow you to bring food inside, so make sure to eat up before you walk around! If your child is like mine and not particularly enthused about seeing beautiful artwork (although his momma is, so the poor boy has to endure it, bless his little heart), then here are some games to make it more enjoyable and interactive! Postcard Hunt- I din't try this out, but my super creative blogger friend Bar (from the gorgeous Art Bar Blog) suggested this idea and it's fabulous. If you have time, visit the museum store beforehand and buy a pack of postcards showing artwork in the museum. Then, have children go on a scavenger hunt and find those pieces of art! Ever take an art class in school? I remember bringing along fancy sketchbooks on field trips and sketching different artwork as I walked through the museum. It was really thrilling because I felt like a real artist just sitting there and drawing. Ooh la la! I wanted to give the boys that same experience, so I made them really simple notebooks from cereal boxes and computer paper. Each boy was thrilled to receive his very own "Art Note Book." (With their names printed on them to make them extra special... of course!) Whenever we saw something particularly inspiring or beautiful, they would pull out their markers and sketch out what they saw. Ok. This one is also pretty obvious, but it worked! Kids love talking about things they love. So we had no problems finding our favorite and least favorite artwork in the room. Of course, this led to discussions about why we liked some artwork over others. It also encouraged all of us to really take a look at all the artwork in the room before making a decision. Done for the day? Artwork unharmed? Children all accounted for? Then, yay- you've had a successful day at at a cultural institution! Go celebrate and treat yourselves to something nice. This doesn't have to be something super big or expensive. It can be something small like a frozen yogurt, box of raisins, juice box, eating lunch outside, visit to the park... anything to give a positive end to your day. And that's it! Hopefully you find one or more of these tips helpful when bringing your kids to the art museum. And if you have any more ideas, I'd love to hear them too! 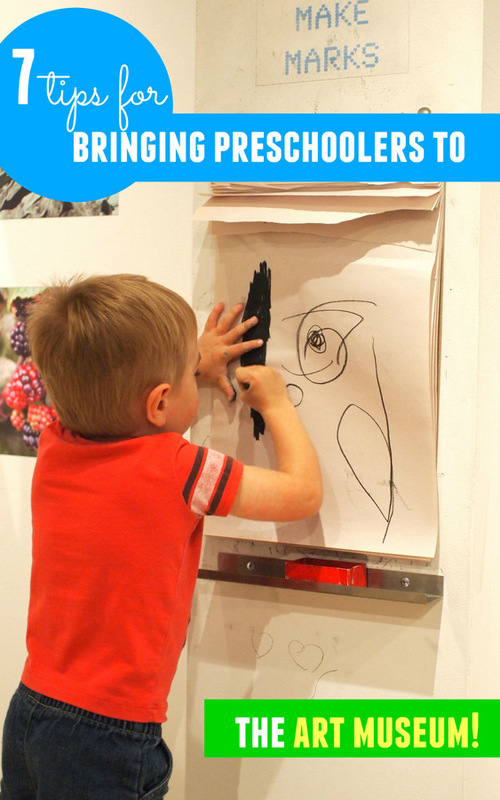 What are YOUR tips for taking preschoolers to art museums?